Los Angeles is the cultural, financial, and commercial center of Southern California. Hence, the city attracts people from all over the world for business trips or vacations. This makes Los Angeles International Airport (LAX) the second Busiest airportin the United States, and one of the largest international airports in the US and world. 1 In 2017, LAX handled 84,557,968 passengers, making it the world’s fifth busiest airport by passenger traffic. 2 LAX serves as a hub city for more passenger airlines than any other airport in the country. 3 LAX has nine passenger terminals in the shape of the letter U or a horseshoe. 4 LAX is adorned with the theme building, an iconic Space Age structure which resembles a flying saucer that has landed on its four legs. The reason behind LAX airport to be one of the busiest airports of United States lies in the fact that it offers 680 flights to 96 domestic cities and 910 weekly nonstop flights to 59 cities in 30 countries on 60 commercial air carriers. Moreover, being the major gateway to Europe, Asia, North and South America, LAX remains crowded most of the time. It is because of this reason that RapidShuttle 247 is proud to serve the transportation needs of millions of travelers that come in and out of the Los Angeles International Airport (LAX) 24 hours a day, 7 days a week. Hassle-free Private, Non-Stop transportation services: As soonest you arrive at the crowded LAX airport after a long flight, we understand that you are anxious to get your destination as soonest possible). The LA traffic does not help lower your anxiety either; thus, one reason to choose RapidShuttle 247 for your transportation needs From and To LAX). 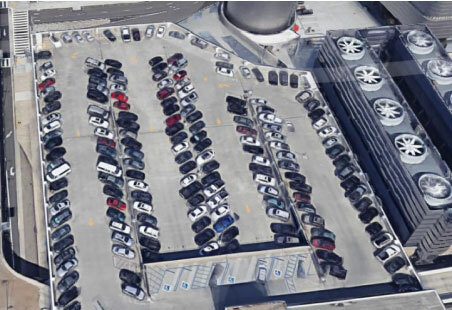 Parking is always an issue: LAX is one of the most crowded airports of the world, hence it is inevitable to encounter a huge rush even at parking lots which remains occupied to more than half of its limit most of the time. So, why to stress about getting early to the airport when a team of RapidShuttle 247 is eager to coordinate your drop off to and from the airport in most comfortable and convenient transportation possible. Being picked up by RapidShuttle 247 is quite easy at LAX airport. Just proceed through the baggage claim area, which is on the lower level. Once you gather your belongs, exit to the curbside, please contact our LAX Airport dispatch at +1 (888) 672-7438 and select option 2 or +1 (949) 667-2743 for further assistance. The LAX Airport dispatch will let you know exactly where to meet your driver, so you can promptly board your vehicle, and you will be on your way.